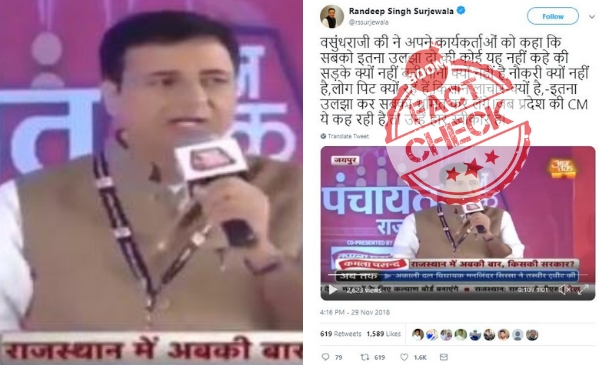 Randeep Singh Surjewala, spokesperson of the Indian National Congress made a misleading claim about Rajasthan Chief Minister Vasundhara Raje when he tweeted on November 29 in Hindi. Surjewala made those remarks during an event held by news channel Aaj Tak in Jaipur. His tweet got more than 600 retweets and 1,600 likes. 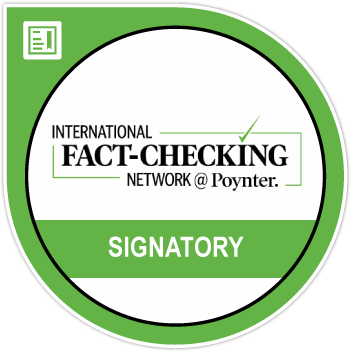 However, BOOM found that the statement Surjewala made during the event and his subsequent tweeted were misleading. At 23 minutes into the video, Raje is seen saying, “The Congress party has been chanting the slogan ‘Gareebi Mitaao‘ (Eradicate poverty) for the last 50 years, but till today they haven’t done any work to eradicate poverty. And when asked about the same they say poverty is not to be eradicated. The more there will be poverty, the more it will benefit us and get us more votes because people won’t get the time to ask us why didn’t we get any work, why didn’t we get water, why weren’t the roads built?, as they will be immersed in their pain. BJP Rajathan Twitter handle also debunked Sujrewala’s claim. Claim Review : Vasundhara Raje has told the workers of her party to confuse people to such an extent that they do not question why are roads not built, why is there no water, why are there no jobs, why are people being beaten up, why are farmers helpless? When the chief minister of a state is saying this, then she has accepted defeat.